Little Giraffe and more Cozy Blue Stitch Club! I’ve been having a little bit of work done on my website (and please let me know if you come across anything wonky), and so, in the meantime, have been mostly posting on Instagram. If you aren’t on Instagram already, I highly recommend it. I think it’s a great platform to connect and talk about crafting. As the popularity of blogs continues to wane, it’s Instagram where I end up spending most of my time connecting with other crafters. And so, I posted the pictures of the last two projects I completed on Instagram – a knitted stuffed toy, Little Giraffe, and the August installment of the Cozy Blue Stitch Club. 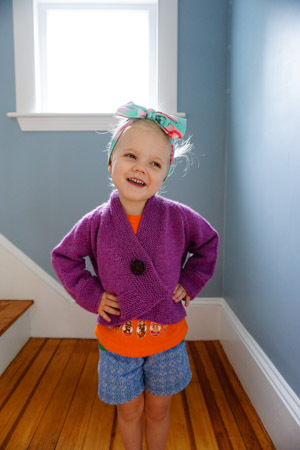 Pattern: Livie sweater by Carrie Bostick Hoge. I mostly followed the directions for the 8th size (6y), but with my gauge being different, it’s a little bit smaller than the specified finished measurements. Yarn: Berroco Vintage in Fuchsia (51176). This is one of my favorite Vintage colors – I’ve used it twice before (Wee Levenwick, Hexathrow). Another favorite color is Blue Moon (51191) (Silverfox Cardi, Odessa). I used just a tiny bit more than 2 skeins for this sweater. Needles: the sweater is mostly knit on US 7 needles, with a predictable 5 spi and 7 rpi gauge. Some of the garter was knit on US 6s, and the sleeves were on US 8s because they were knit in the round, which is tighter for me than stockinette knit flat. The gauge measures the same, so I think that trick works for me! Finished dimensions: 26.5″ chest circumference, 9″ from cuff to armpit, and 13″ shoulder to hem (it’s a cropped style). The sweater is a little bit roomy on Sonya… or you can say she’s just living her best preschool BlanketLife, all cozy and warm and wrapped up! She loves the big button, which has an intricate purple design that proved difficult to capture in a picture. 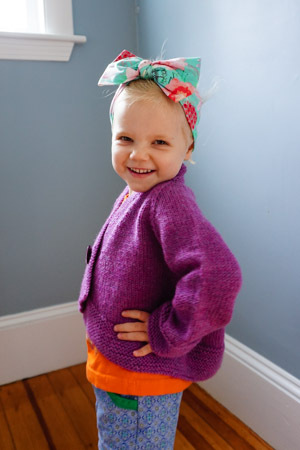 If you knit this sweater, I would recommend that you try it on to figure out button placement: I didn’t get it right just by looking at the sweater and estimating, really had to have Sonya try it on. 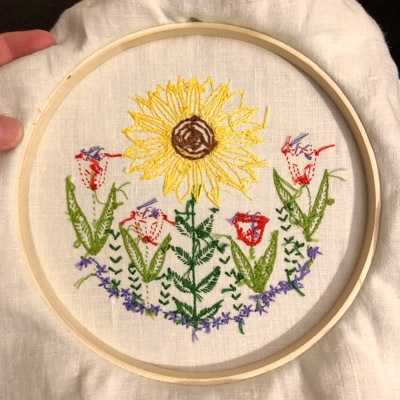 After recently completing the Satsuma Street stitchalong, I decided to branch out a bit and try other types of embroidery. 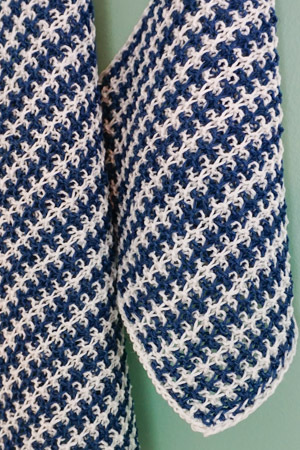 A few friends suggested checking out the Cozy Blue Stitch Club, and it seemed like the perfect thing – small, not too pricey, and in a way, open-ended, with the possibility of interpreting the design in so many different ways. I signed up in May, but June’s shipment wasn’t quite my style, so I didn’t stitch it. But July’s was a beautiful sunflower with some other smaller flowers and grasses, and I loved it immediately! In this one small design, I was able to try out a bunch of different stitches, including backstitch, whipped backstitch, Leaf Stitch, Cretan Stitch, Chained Feather Stitch, chain stitch, stem stitch, link stitch… I used Mary Thomas’s Dictionary of Embroidery Stitches and the DK Stitch Dictionary to look up the stitches (both purchased from the “used” selection on Amazon – and both in perfectly serviceable condition!). 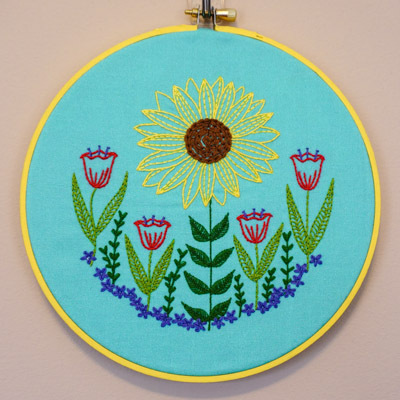 I mostly worked with two strands of floss, except the sunflower middle, which is four strands. I stitched through the sampler cloth and a piece of linen (from a forever-ago UFO), as recommended. Mostly this was no problem, but there were some puckered bits in the middle of the embroidery that may have come from stretching the two fabrics slightly differently. 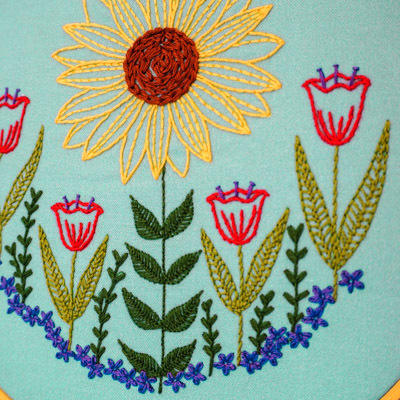 Knowing that I have more of these pieces coming my way, and that I didn’t want to spend $$$ each time to get them framed professionally, I bought a 6-pack of 7″ embroidery hoops on Amazon, and followed this tutorial to finish the back of the embroidery work. 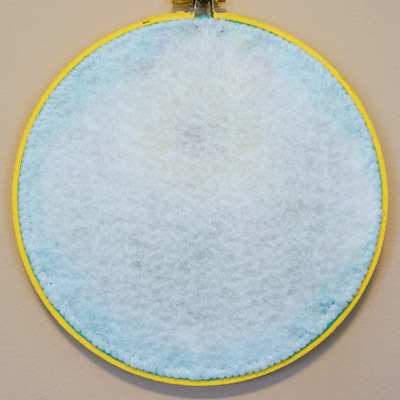 But first, I painted the hoop a happy yellow, which I thought went nicely with the aqua color of the fabric. The hoop is now hanging on a Command hook in Sonya’s room. 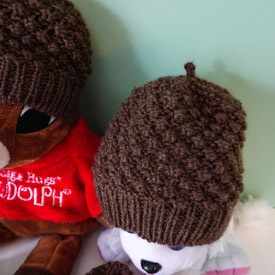 I must thank Huggie Hugs Rudolph and CPK Poodle “Adoptimal” for modeling for me, LOL! I didn’t want to stick those booties on them for fear of stretching them out, but I think they’d fit perfectly, too! The noteworthy thing about these 2 hats and 2 pairs of booties is that I carved everything out of one skein of Berroco Vintage! That’s amazing! 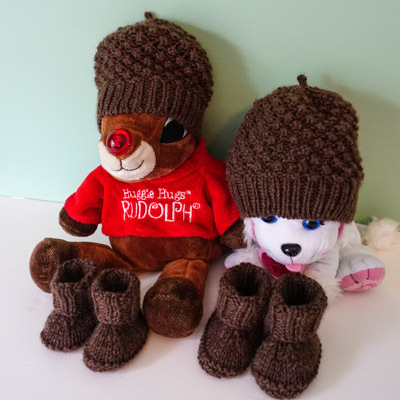 Patterns: hats are Little Pip’s Acorn Cap by Kyrie Mead, and booties are Baby Hausschuhe by Ines M. I mucked with the stitch counts and gauges for both in order to make a set to fit a newborn, and another set to fit a 3-month old (ish). Yarn: Berroco Vintage in “mocha,” precisely one skein for all these pieces! Vintage is my go-to yarn for all baby projects. Needles: US 5 and US 7 throughout. 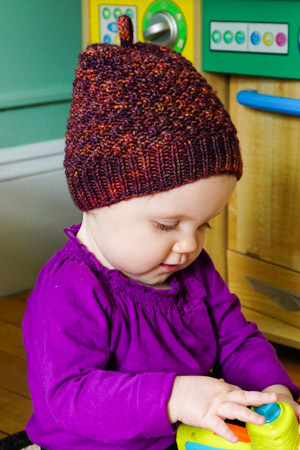 If the hat looks familiar, it’s because once upon a time, toddler Sonya had one, and looked so adorable in it! 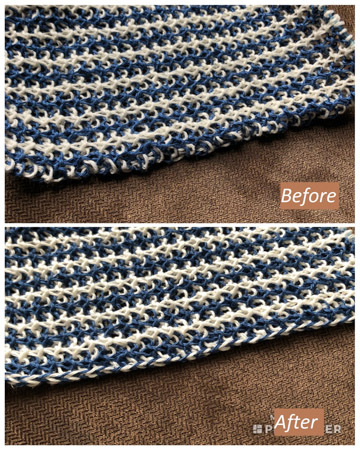 While in-between some big projects, I decided to whip up a quick linen towel and washcloth. Linen is a great change of pace; it’s strong, not stetchy, and holds its shape wonderfully to create a very textured fabric. The feel through the fingers is very different than wool, and even different than cotton. And Euroflax linen, in particular, from the lovely folks in Louet, is a standard go-to for many knitters because it’s so lovely! 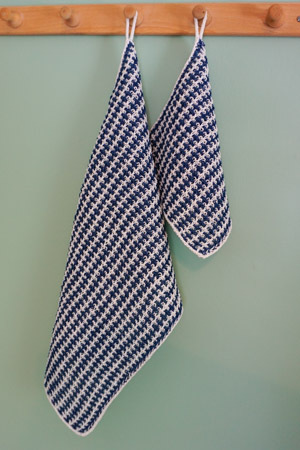 Pattern: Slip Stitch Dishtowels by Purl Soho, “three-and-one tweed pattern” worked over 75 stitches (as written) for the towel, and over 51 stitches for the washcloth. Yarn: Louet Euroflax in cream (rescued from this 10-year old UFO – love how blogs keep us accountable!) and French blue, about 275 yards/102 grams and 90 yards/33 grams (total, of both colors) for the towel and washcloth, respectively. Needles and finished dimensions: I used US 3 needles, as specified in the pattern, and the finished dimensions after blocking are is 11″ x 18.5″ and 8″ x 8″. I made a nifty mod along the right edge of the fabric – where you switch colors – to create a tidy edge for the border. I put the steps in my Instagram stories. I hope you got to see it!